“When We Were Kings” chronicles perhaps boxing’s singular match, the grandiloquently titled Rumble in the Jungle that found Muhammad Ali re-claiming the heavyweight championship from a human battering ram rather than an affable grill proprietor named George Foreman in the heat and humidity of Zaire in 1974. The film was released in 1996, winning an Oscar, but it never looked like a mid-90’s film; it looked predominantly like a film of its era and that’s because it was. Director Leon Gast was on location in Africa to film the music festival set to coincide with the fight, only to find a series of crazed financial and political events altering his strategy and prompting him to center his burgeoning documentary on the Rumble in the Jungle instead. And as funding to finish the product went belly up, years passed before its completion, prompting the twenty year distribution delay. That time lapse, as it fortuitously happened, became the doc’s greatest ally. Its official release date was October, a few months after Ali lit the flame at the 1996 Summer Olympics in Atlanta, a heroic moment that doubled as a kind of coming out from a self-imposed exile on account of the Parkinson’s Disease that had riddled him. Yet that cozy image of him cradling the Olympic torch also allowed a great multitude less than enamored with his thoughts and feelings in the late sixties toward the United States to sort of conveniently gloss over Ali’s considerable radicalism in their memory. But because “When We Were Kings” was not shot after the fact, it was free of any nostalgic, glory of sport haze. It isn’t a time capsule; it’s a time machine. Right there at the beginning Ali intones that he’s “going to Africa” because “Africa’s my home.” He continues: “Damn America and what America thinks. Yeah, I live in America, but Africa is the home of the black man, and I was a slave four hundred years ago, and I’m going to fight among my brothers.” This is the pre-torch Ali, the unabashedly volatile Ali, the man that refused to go to Vietnam (read: did not dodge – refused, bring on the consequences). The immense, inadvertent genius of “When We Were Kings” is that we get to see this Ali up close and personal without filtering it through the passage of time. It is urgent and immediate; it is awesome. Not that the film is completely free from filters. At the urging of producer Taylor Hackford, after the fact interviews were filmed, including Spike Lee, but also featuring literary titans George Plimpton and Norman Mailer, both of whom were on hand to cover the fight. The latter two come across intent on painting Ali in the same light as Rocky, an improbable underdog out of his depth who summoned some cinematic superpower, absorbed all Foreman could give and still won. But Ali, of course, was never Rocky since Rocky was principally a white fantasy at the expense of a black champion, even if those two characters became friends in subsequently soppier movies. While Foreman made no friends in Africa, Ali endeared himself to the populace, a populace that probably seemed much more accepting of him than the one back home. 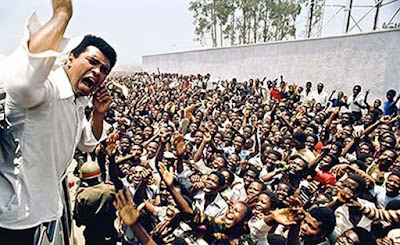 There is a memorable shot in “When We Were Kings” of Ali jogging through the streets of Kinshasa while local children run alongside him, chanting his name and chanting for him to beat Foreman. I thought of that shot last November while watching “Creed” when Adonis Johnson runs through his neighborhood in the midst of training, surrounded by neighborhood kids on motorbikes popping wheelies, a re-purposing of the famous Rocky training montages, where it isn’t simply Adonis training by himself but in concert with his people. That’s what Muhammad Ali was too, of course, The People’s Champ, and that title was not mere bluster. It was disappointing, if not unsurprising, that in the wake of Ali’s death, and even at his funeral, people attempted to box Ali in as this or that, even my nation's President, who categorized Ali as America. Well, yes and no; he was America but he was so much more and “When We Were Kings” is the evidence to prove it. Muhammad Ali was the whole wide world.